The Bulfin Heritage Cycle Rally 2019 - Meandering Monks & Medieval Miles. Discovering the hidden history and heritage of Ireland, on High Nelly bicycles, following in the 'wheelrims' of William Bulfin (1863-1910). William Bulfin is the inspiration behind our yearly Heritage Cycle. In the early 1900's he toured Ireland on his trusty steel framed bicycle, made by Pierce of Wexford. He later published the book 'Rambles In Eirinn' in which he recounted his fascinating journey through the Irish countryside. In previous years the Bulfin Heritage Cycle Rally has followed some of the routes, as outlined in the remarkable book, through Offaly, Laois, Kilkenny and Tipperary. We travel in vintage attire, on High Nelly bikes, and our journey is punctuated by heritage site visits, heritage talks, historical re-enactments, music and food; so ours is a gentle paced leisure cycle, despite the odd difficult hill! 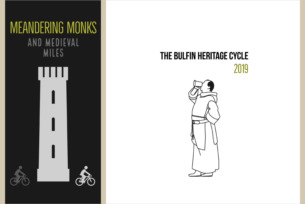 The theme for The Bulfin Heritage Cycle Rally 2019, is 'Meandering Monks & Medieval Miles' and we will forge a trail through Ireland's rich monastic and medieval history. So if you are interested in cycling, history, heritage or just having a wonderful fun filled, couple of days, The Bulfin Heritage Cycle Rally, really is for you! It is a leisurely cycle, along a route that promises to be full of hidden history, and heritage site visits, so chalk it down on the calendar - August 24th & 25th 2019! And remember - All You Need Is A Bike!